With their thick, white stalks and long green leaves, leeks resemble giant green onions. Related to onions and garlic, leeks have a much milder aroma than their botanical cousins with a subtle blend of sweet-herbal flavors. They are more widely used in Europe than the U.S. and are an essential ingredient in French cuisine, such as the classic potato and leek soup, vichyssoise. While available year-round, leeks are most plentiful from autumn to early spring. Chop or slice them and add to salads, soups, sauces, and egg, cheese and vegetable dishes. They can also be cooked whole and served as a vegetable. While sometimes sold individually, leeks are often tied in bunches of 3 or 4 at the supermarket. Select smaller sized leeks when possible for maximum tenderness. Larger leeks can be tough and woody. The leaves should be crisp and green with no signs of wilting or yellowing. Look for white stalks that are straight, firm and free of blemishes or cracks. The attached roots should be pliable and light in color. Refrigerate unwashed leeks in a plastic bag for up to 5 days. Dark green leek tops are too tough to eat; only the white and light green portions of the stalk are edible. Trim off and discard the roots and the leaf tops down to where the dark green color begins to turn pale. Because leeks are grown partially underground, soil and grit are often lodged between their concentric layers. 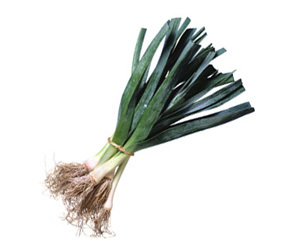 To thoroughly clean, cut each leek lengthwise to within 1 inch of the root end. (If the leek is cut completely into halves, it will fall apart during cleaning.) Separate the layers while rinsing well under cold running water to remove all embedded soil. If the soil is difficult to remove, soak the leeks in a bowl of water for 10 minutes, letting the soil sink to the bottom of the bowl. Cut the leeks lengthwise into halves or quarters, then slice or chop as desired. Leeks can be braised, steamed or sautéed until crisp-tender. Avoid overcooking them or they will become soft and slimy. Thinly slice young, tender leeks and add to tossed green salads in place of red or green onions. Use leeks in any casserole that calls for onions or garlic, especially those with ham or cheese. Add chopped or sliced cooked leeks to quiche fillings or scrambled eggs. Stir chopped cooked leeks into mashed potatoes for incredible flavor. Substitute leeks for onions while cooking them with carrots and celery for soup, stew and stuffing bases. Enhance cream sauces with leeks and serve over hot cooked pasta, vegetables, fish or poultry. Lemon, basil, sage, thyme and mustard all pair well with the flavor of leeks.